Brendan Fraser has built a successful film career mixing critically acclaimed dramas such as "The Quiet American" and "Gods and Monsters" with blockbuster family fare such as "George of the Jungle" and "The Mummy." His latest falls firmly into the second category, as Fraser costars with Hollywood heavyweights Bugs Bunny and Daffy Duck, among others, in "Looney Tunes: Back In Action." Fraser confesses to The Early Show co-anchor Rene Syler he is a kid trapped in a man's body and acknowledges his love for cartoons. He says, "When I was a kid, it was the one thing that I consistently relied on to being absolutely hilarious. A lot of other people, too, actors, comediennes, writers…." In "Looney Tunes: Back In Action," Bugs Bunny and Daffy Duck are feuding again. 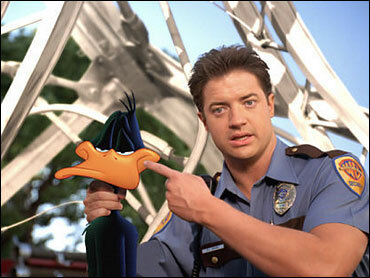 Tired of coming in second, Daffy leaves the studio with a little assistance from security guard/aspiring stuntman D.J. Drake (Fraser). The two team up to solve a global kidnapping/stolen jewel caper with some funny results. And the animation combined with the human actors looks seamless. Fraser says, "The technology has come to such a place now where the audience really does believe that live action people are on screen with animated creatures. It's interesting, because you have to do what you're really expected to do in the first place, which is just imagine that it's there, buy into the situation and as long as the actors believe it, the audience will." Fraser also does the voiceover of Tazmanian Devil and did a bit at Syler's request. He added, "He hooks up with She-Taz, there is a love connection. But that's a higher pitch and I've done it a few times before this week so please don't ask me to do that," he begged. What he is not tired of doing is entertaining his "Baby Taz," as he calls his 14-month old child, showing a picture of his baby, Griffin Arthur. He says fatherhood "has just given me the absolute reason to do everything that I do with so much more certainty - and how much I get out of it, how much I love my wife more, how much I love this kid. It changes your life, once you have that kid with you. It's hard to articulate, but those of you out there who have kids, you know what I'm talking about." In 1991, Fraser made his feature debut in a bit part with one line in Nancy Savoca's "Dogfight"; he made his television acting debut in "Guilty Until Proven Innocent"
In 1992, Fraser was featured in a leading roles for "Encino Man" and "School Ties"
In 1995, the actor had a small role as a Vietnam veteran in the 1970s flashback segments of "Now and Then"; appeared with Parker Posey, Martin Short and Elizabeth Perkins in the L.A. production of John Patrick Shanley's play "Four Dogs and a Bone"
In 1997, Fraser had title role in the surprise box-office success "George of the Jungle"; earned critical praise for his dramatic performance in "Still Breathing"
In 1998, Fraser co-starred as the gardener who is befriended by film director James Whale in "Gods and Monsters," Bill Condon's adaptation of Christopher Bram's novel "Father of Frankenstein"
In 1999, Fraser played a 35-year-old man who was raised in an underground bunker in the comedy "Blast From the Past"; he was cast as an Indiana Jones-like archeologist in the remake of "The Mummy"; and the actor starred in the live-action adaptation of the cartoon "Dudley Do-Right"
In 2000, starred in remake of "Bedazzled"
In 2001, Fraser re-teamed with "Bedazzled" co-star Frances O'Connor in a London stage revival of "Cat on a Hot Tin Roof"
In 2002, Fraser made a two-episode guest appearance on the NBC sitcom "Scrubs"; co-starred in the drama feature "The Quiet American" with Michael Caine, who received an Oscar nomination for his performance.